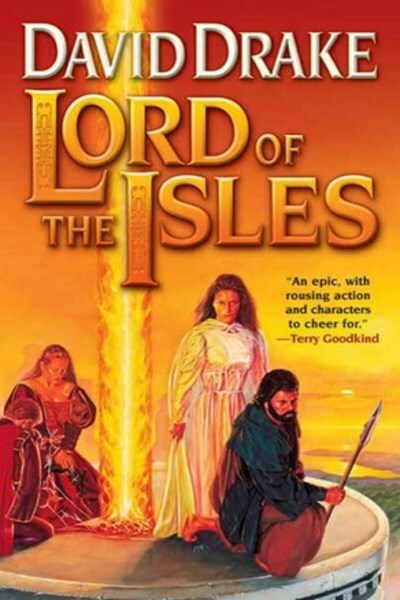 Lord of the Isles by David Drake is the next Tor.com free giveaway I'm going to review. This one is going to be a short one because, ultimately, my time with this novel was short. There were two problems I had with Lord of the Isles: (1) the characters didn't reach out and grab me and (2) the author didn't allow for any time for the characters to reach out and grab me before the story swept them away. Unlike a Robin Hobb novel, for example, where the reader is introduced to the characters with a steady, depthful narration while the story moves along in like fashion, Drake dumps both characters and story on us with such brusqueness it was difficult to enjoy either. The prologue details magic gone awry as a sorcerer successfully repels an attack by invaders but sinks his own city in the process. A trireme is thrown off-course from the resulting choppy seas and comes upon a small, out-of-the-way town where they discover the missing daughter of an important count and countess who were slain years before. Next thing we know this young woman is aboard the trireme and being whisked away to claim her birthright. Meanwhile, her brother, who we now know is not really her brother, looks to also be leaving the town via a visiting merchant. I stopped at that point, so I can't say what happened next. While Drake is an accomplished writer of military fiction, he fired a blank on this one. Lord of the Isles, unfortunately, isn’t worth your time. Have you read any of Drake's other novels? I haven't read him, but I enjoy military fiction. Thought you might have some recommendations from him that I should read. Seas of Venus is the only other thing I've read by him. It was OK. Definitely a lot of guns and beasties. He seems to be mostly known for the Hammer's Slammers series.